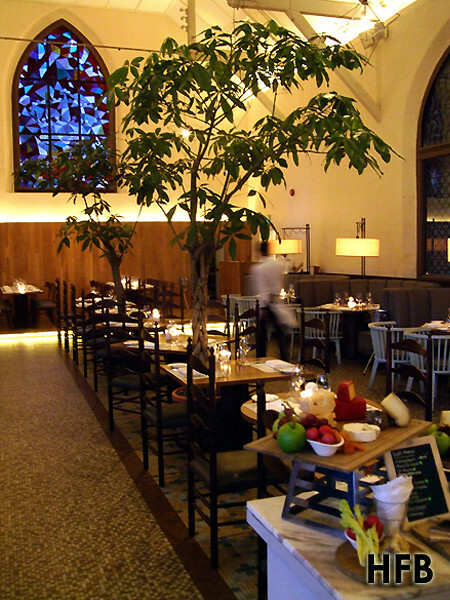 The White Rabbit has established itself around the local modern-dining scene for quite sometime, and HFB was finally able to strike it off from his Gastronomic Wishlist (Yes, it has been updated). 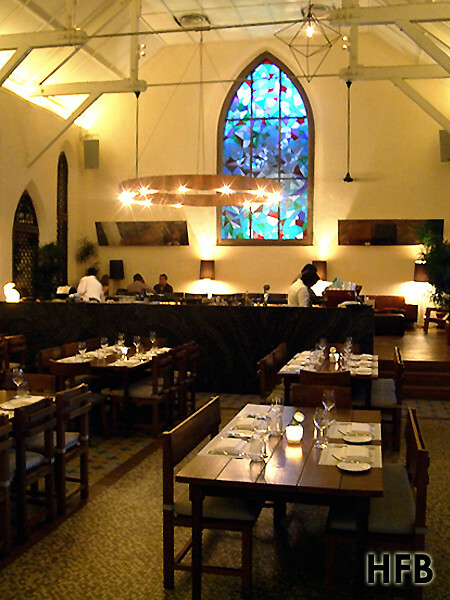 Housed in a beautifully-restored chapel located off Dempsey, HFB was totally wooed by its colonial charm of stained glass and high ceiling – though the neatly-rowed wooden tables and chairs kinda reminded him of the dining hall of Harry Potter, the movie. Heh! 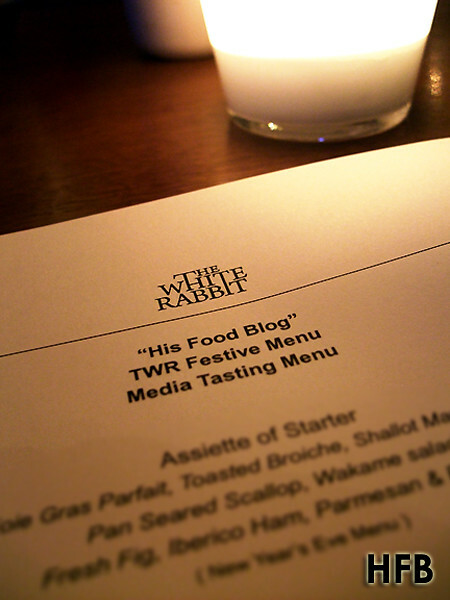 The tasting menu was a mixed selection of dishes from The White Rabbit’s Festive Menu starting from Dec 2011, and dinner commenced with the Assiette of Starter from the New Year’s Eve Menu. 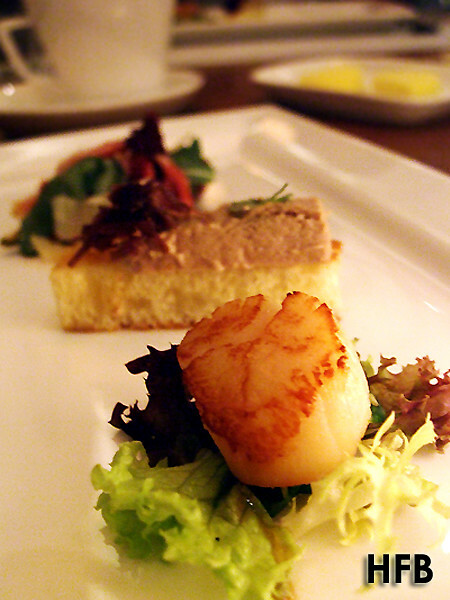 Diners can looked forward to the trio made of Foie Gras Parfait with Toasted Broiche and Shallot Marmalade, Pan Seared Scallop with Wakame Salad, as well as the Fresh Fig with Iberico Ham coupled with Assiette Parmesan & Rocket. 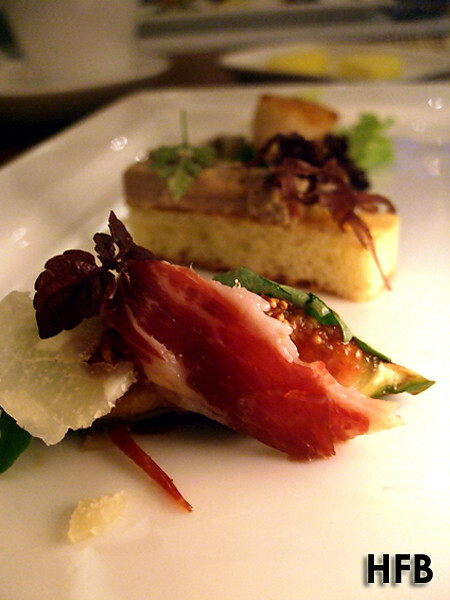 HFB was totally awed by the combination of fig and Iberico ham – it was certainly a marriage made in heaven as the sweetness of the fruit complemented really well with the savoury of the ham, as well as provided the needed texture for bite. Brilliant! HFB although a great fan of foie gras (apologies to animal lovers) is not a keen admirer of foie gras parfait. However, even he had to conclude that he was rightly intrigued by the shallot marmalade that went absolutely well with it. Nothing short of excellence here! Any respectable restaurant should execute a seared scallop pretty neatly and The White Rabbit did just that. While there was nothing to pick on, there wasn’t anything novel to excite HFB’s palate with it. The scallop did retain its juiciness and the wakame provided the added texture to it. 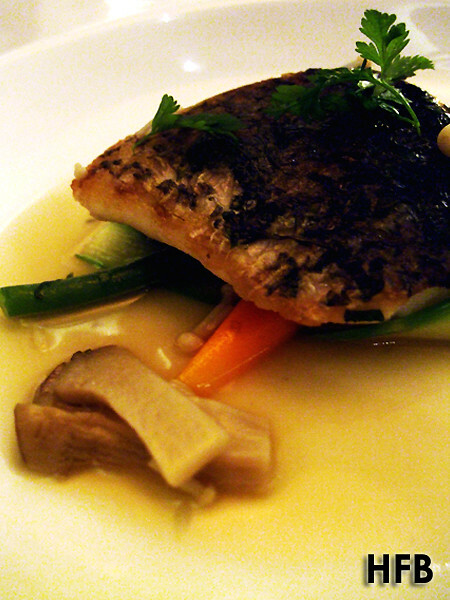 After sampling The Dining Room’s smashing Red Snapper Fillet, HFB’s expectation was slightly heighten when he noticed that there was a Champagne Poached Seabass on the tasting menu that comes with Mushroom Broth and Baby Vegetables. Under the Festive Degustation Menu, HFB thought the fish was nicely poached (by sous-vide method he presumed) and left a nice clean finishing on his palate. He also liked that there were lots of vegetables to match the dish. The only drawback was the mushroom broth, which HFB felt altered the texture of the seemingly crisp skin; mushroom foam perhaps might be more ideal, but he would never uncover the truth. HFB is not a keen fan of turkey because of the perceived dry nature of its meat. But if one executed it in sous-vide style; now that’s a different story! 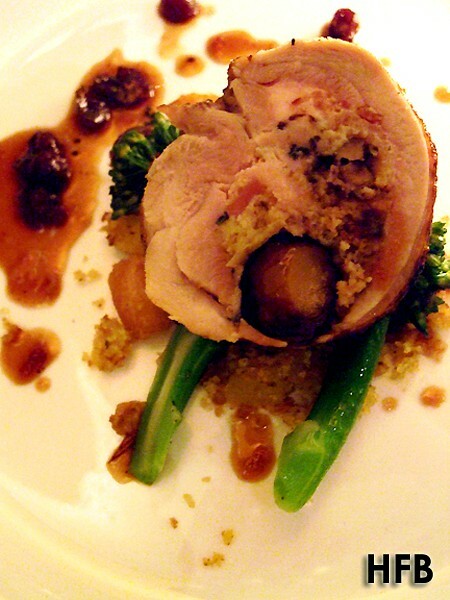 The White Rabbit’s version for its Festive Set Lunch Menu came in Roulade style and stuffed with Chestnut and Smoked Oyster and coupled with Cornbread & Sage on the side, and accompanied with Cranberry Sauce. Tender would be what HFB would describe it, and rightly so. Funnily though – either it was all chopped up, or maybe HFB didn’t really chew well before swallowing it – he tasted the chestnut stuffing but missed the smoked oyster within it. However, what really stood out for him was the supplement of cornbread and sage that he thought was utterly spectacular! Really palatable and provided a much-welcomed subtle sweetness that rounded the dish exceptionally. HFB would probably be crucified by The Marmalade Pantry’s ardent fans, but he stood by his conclusion that The White Rabbit’s offering of Sticky Date Pudding with Vanilla Ice Cream and Caramel Sauce offered during the Christmas Eve Dinner Menu more than outclassed the apparent (former) yardstick. It was moist, not too sweet and everything just fell in place marvellously. 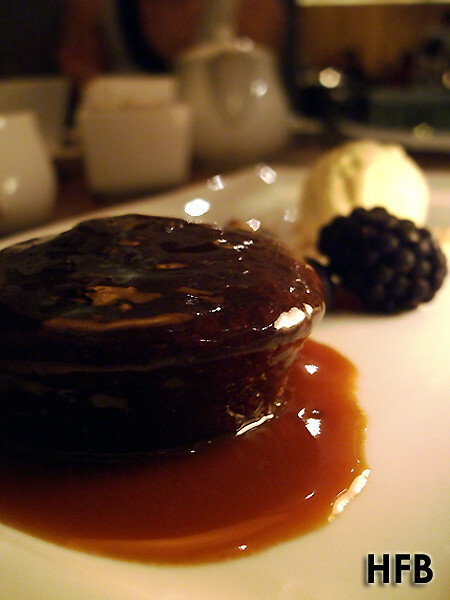 It’s been awhile since HFB enjoyed a really good Sticky Date Pudding, and he was glad he did. Disclaimer: No ratings would be given, as this is an invited taste test. HFB would also like to take this opportunity to thank Cheryl and The Lo & Behold Group for their hospitality. I was there for the food tasting too! Which day did you go? I think I saw you with a lady at a booth seat near the entrance? I was there on 1st Nov. It was a Tuesday. Yep I was sitting at the booth seat near the entrance. Were you there too?